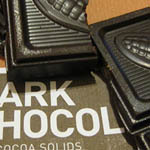 While it may seem hard to believe, moderate amounts of high-quality dark chocolate is good for you. Research has shown that dark chocolate contains polyphenols called proantocyanidins, which appear to slow the progress of certain cancers, such as lung cancer. These polyphenols cause a sharp drop in a receptor essential to the blood vessel growth of tumors. While more research needs to be done to establish chocolates full anticancer potential, current findings are hopeful. The recommended amount to consume of dark chocolate in order to reap its benefits is about 40 grams (1 1/2 ounces) of dark chocolate with 70 percent cocoa mass.